As predicted the weather today hasn’t been particularly nice. I spent some of the time writing my Saudi reports whilst Jan had a small experiment with the diesel stove. 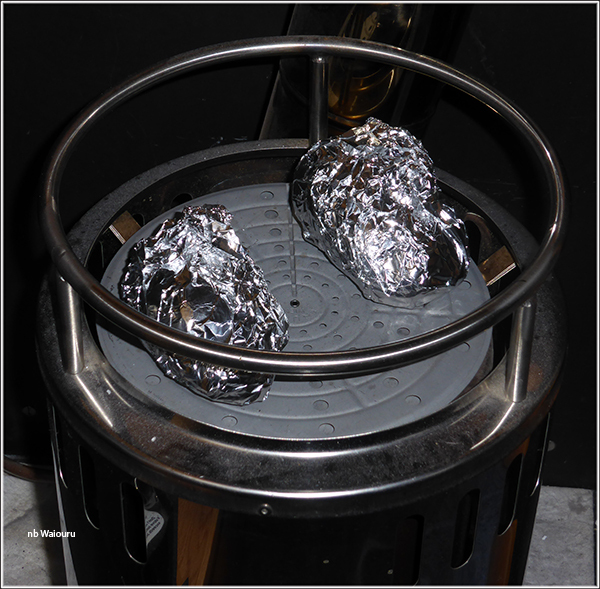 She placed the trivet on the hotplate and then placed two potatoes wrapped in aluminium foil on top. From the far end of the galley she asked me “Can you hear the potatoes?” With my poor hearing of course I couldn’t. It wasn’t until I placed my good ear directly above the stove that I could hear the hissing and popping sound from the spuds. But they did cook! 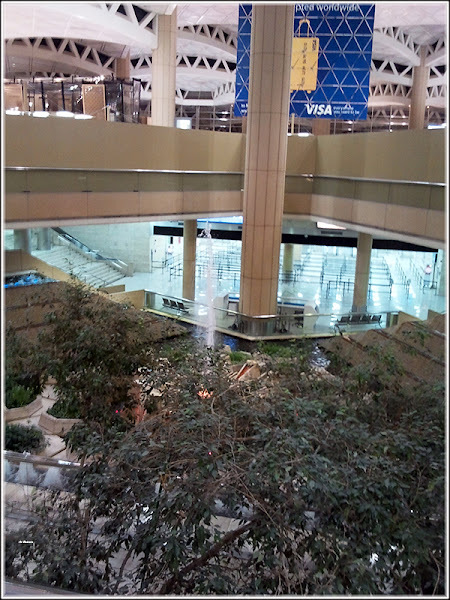 When cleaning up the mobile phone I discovered a couple of photos I’d taken at Riyadh airport. The main airport is north of the city and consists of four joined terminals and a separate 5th terminal for royalty (Saudi royalty I guess). Terminal 2 is for Saudi airlines and Terminal 3 for overseas airlines. As I was flying BA I departed from Terminal 3. Each terminal has exactly the same layout. The second floor is the departure lounge whilst the first floor is arrivals. You might be able to see the immigration area. The Saudi’s are very much into water features and green vegetation. Probably because the country is mostly dry and brown desert. The arrivals area has a steeped three sided water feature with shrubs and trees. 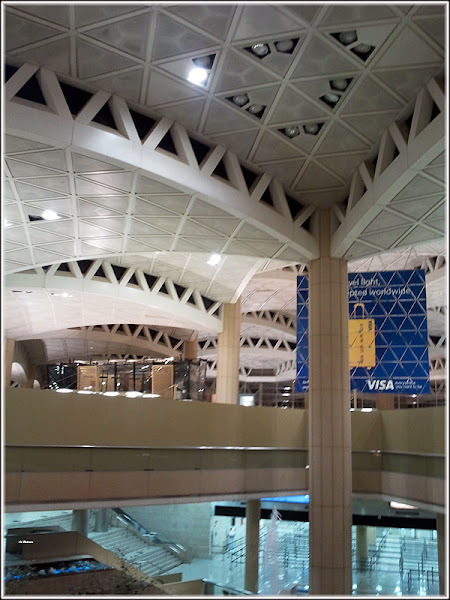 The terminal roof has been constructed of multiple arches or shells covered in geometric patterns. At 1am it wasn’t crowded. Too much time inside the boat starts to make you a little stir crazy and I went for a walk to get some fresh air. 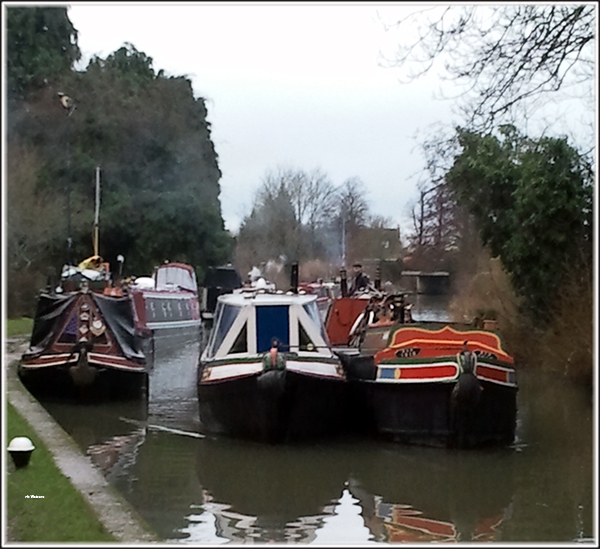 I recall when we first visited Braunston on a hire boat. It was a very quick walk around the village and we departed thinking “we must return one day”. Now I’m so familiar with the village and surrounding countryside that I can’t wait to leave for greener pastures. Walking back to the boat I could hear the unique sound of an old working boat engine. But no sign of the boat. It wasn’t until I rounded the bend in the canal that I could both see and hear a breasted boat and butty heading towards me. The engine was very slowly revving and sounded like it was on its last legs. As if it was deciding whether on not to fire. I assume it was a Bollinger? Weather permitting, the plan for tomorrow is to go up Braunston Locks and through the tunnel before finding a mooring somewhere around Norton Junction.